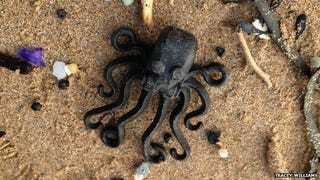 Why Are Lego Washing Up on the Beaches of Cornwall? The beaches at Cornwall in England are beautiful, majestic ... and the repository for some seriously weird plastic garbage. For years, Lego pieces with nautical themes have been washing up on these shores. But why? Basically, the answer is that the deep currents in the Atlantic ocean are powerful and mysterious. It started in 1997. On February 13 of that year, a rogue wave hit the New York-bound cargo ship Tokio Express while it was only 20 miles off Land's End, on Britain's southwest coast. The ship stayed afloat; some of its cargo, however—62 shipping containers—were thrown overboard as the vessel pitched. One of these containers contained Legos. Tons of Legos—many of them, because of course, nautical-themed. There were toy kits that included plastic aquanauts. And spear guns (13,000 of them). And life preservers (26,600). And scuba tanks (97,500). And octopi (4,200). In all, that day in 1997, exactly 4,756,940 pieces of Lego sank to the bottom of the sea. But they didn't stay submerged. Or, at least, they didn't all stay submerged. One container opened; its contents billowed out into the Atlantic. "No one knows exactly what happened next," reporter Mario Cacciottolo notes, "or even what was in the other 61 containers, but shortly after that some of those Lego pieces began washing up in both the north and south coasts of Cornwall." And: "They're still coming in today." Apparently this isn't the first time Cornwall has been the recipient of strange cargo lost at sea. Another ship lost boxes of cargo carrying plastic lighters, which has resulted in years of the tiny gadgets washing up on shore.